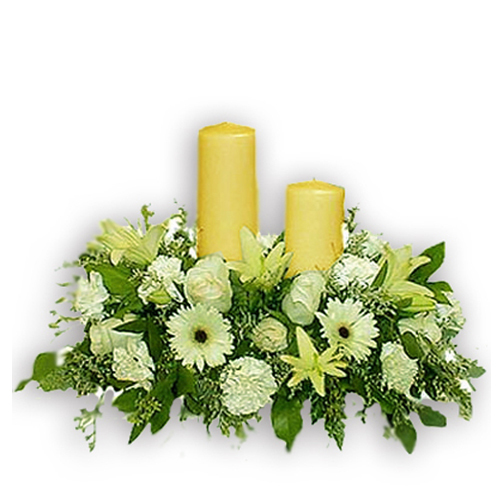 Table Arrangement Includes 25 Mix White Flowers with lot of green fillers and 2 Candles place in middle of flowers. It is really a very thoughtful gift. 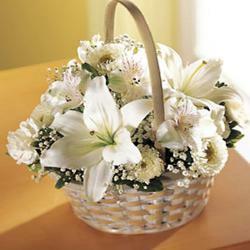 You can use these white flowers arrangements to show sympathy for your loved one or just make him or her feels better and supported. 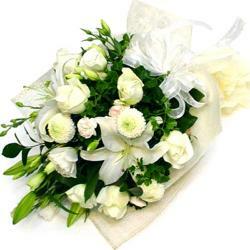 White flowers can be used to greet your dear ones for their weddings or any happy occasion as well as, they can also help to make your loved one feel supported in the harsh times. This is luxurious centerpiece and stunning table arrangements of White flowers along with candles. 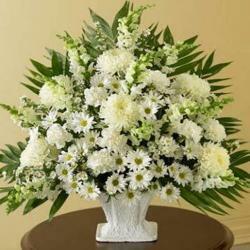 This Arrangement Includes 25 White flower like Roses, Gerberas and carnations with lot of green fillers and 2 Candles place in middle of flowers which would be center of attraction. You can place the order www.giftacrossidia.com and get delivery at your door step. Product Details : Table Arrangement Includes 25 Mix White Flowers with lot of green fillers and 2 Candles place in middle of flowers.